It is no exaggeration when we say that Costa Rica is a plant paradise. We, literally, live in the wonderful world of plants. Costa Rica contains over 5% of the world’s biodiversity of flora and fauna, while encompassing only .025% of the earth’s land mass. To put the country more into perspective (at least for those who know U.S. geography) it is about 4/5 of the area of the state of West Virginia, which is the 9th smallest U.S. state. 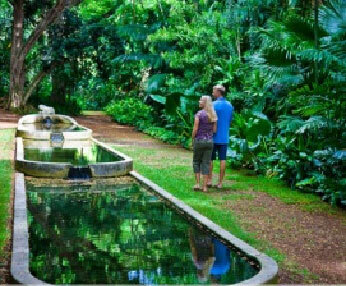 Costa Rica consists of 12 different, eco-climatic zones, which range from the coastal lowlands to the cloud forests. Within these twelve zones grows over 11,000 species of native, vascular (has a xylem and phloem – not including mosses, lichens, etc) plants, including 1,500 species of trees, 1.300 species of orchids, 800 species of ferns and 200 species of bromeliads. These very impressive numbers have been attributed to the location of the country. It has been defined as a “bridge” between North and South America, which links these two continents together. For this reason it is believed that Costa Rica has inherited an astonishing diversity of plant (and animal) species from both continents. 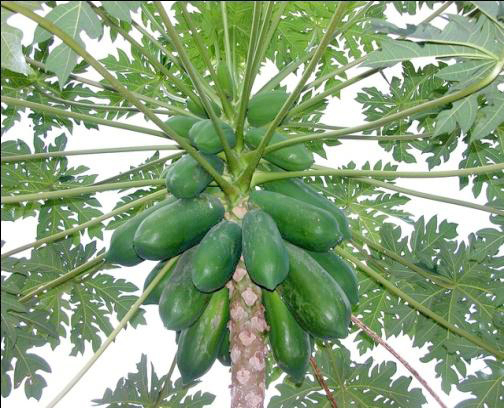 If you had to make a short list of tropical fruits to grow and to consume, papaya, Carica papaya, should be at the top of your list. Papaya – commonly called Pawpaw in parts of the world – is a super food whose health benefits outweigh those of many other fruits and vegetables. It is rated as one of the top three most nutritional fruits by many nutritionists. Christopher Columbus called it “the fruit of the angels”. That is a statement worthy of merit and some deep contemplation. No one can dispute the exquisite elegance, beauty and allure of a masterfully-crafted and finely-finished piece of wood. Its brilliance and warmth, glass-like texture and intricately-designed natural grain are one of the most revered architectural elements known to man. It has graced castles and palaces of royalty and mansions of the rich and famous around the world, and will continue to do so at all expense. Tropical hardwoods such as Red and Cuban Mahogany, Primavera, Cocobolo, Teak, Purpleheart and Brazilian Cherry will forever be admired and cherished in the building and wood craft industries – unlikely to ever be fully replaced or forgotten. Where do you go when you just want to forget about life for awhile – to relax, to reflect, to walk at a snail’s pace and breath it all in or to spend some passive time with family or friends away from your home? Perhaps you go to the beach, or shopping, or to a park or for a drive. Whether we are still of the working class or retired, our lives seem to be so full of physical and mental activity that we forget to stop…. and smell the roses. Having a refuge – a safe and peaceful place to go – is healthy and essential for our overall happiness and well-being. Plants can stir your emotions – induce in you a feeling – if not by their unparalleled beauty, then by their majestic nature. Have you ever been in the presence of a plant and felt just a little humbled? Awed? Even slightly intimidated? Perhaps, somewhere in your life, you have come upon a tree, for example, where you almost felt the need to fall down on your hands and knees to praise its magnificence and grandeur. Trees possess this power and ability more than most plants. In the northern latitudes and temperate climates of the world there are the humungous Northern Redwoods, the massive Tulip Poplars, the strong and mighty Oaks and the supreme Maples and Beeches. Whether you are overcome by its dramatically huge trunk diameter or its sky-bound height or its overall grandness, trees can make us humans feel like tiny serfs in their almighty kingdom. Their inherent power and beauty inclines one to address them as “your majesty”. A million or so years ago, when the earth was younger and the seas covered the land and freshwater seas were abundant, billions of algae -like organisms developed. All of the waters of the earth where inhabited by microscopic one-celled, algae-type plants called diatoms (Melosira spp.). These diatoms absorbed the minerals (mainly silica) from the water, creating protective shells or exoskeletons for themselves. They lived in quantities beyond the mind’s ability to conceive and provided nutrition and sustenance for other forms of sea life. As they died, their exoskeletons sunk to the bottom of the sea beds where vast deposits- thousands of feet thick – were laid down. When the waters receded, these huge deposits were eventually covered with land and the shells fossilized and compressed into a soft, chalk-like rock called diatomite or diatomaceous earth (DE). Geological upheavals over the eons have exposed these abundantly-rich sedimentary deposits. With all of the boldly exotic-looking tropical beauties that we have to choose from to use in our gardens and landscapes, like Helcionias, Gingers, Aroids, Marantas and Crotons, we sometimes forget that we also have a fabulous selection of flowering tropical shrubs that add even more color, form, grace and pizzazz to our world and for our eyes to behold. Unlike their aforementioned garden companions, flowering shrubs perform nearly year round and add a rainbow of color and flower form to your garden or landscape. Below are just a handful of what I believe are some of the most noteworthy of the most commonly seen in our area and in a nice assortment of colors. Remember also that most flowering shrubs give their best performance when sited in a location where they receive at least 6 hours of full sun. Allow me to introduce you to one of the shadiest families I know of – the Marantaceae Family. They love dark, damp, hummusy places….. but, are actually a fine and honorable group of plants that have even been known to pray. These bold beauties exult and thrive in the shade, where their colors are more pronounced, rich and vibrant. There simply could not be a lovelier selection of shade- loving plants than those that are found in the Marantaceae Family. It is commonly known as the Prayer Plant Family due to the fact that a few of the species of this family (mainly Maranta leuconeura, commonly called “Prayer Plant”) rolls together its leaf edges and slants upward, like praying hands, in response to darkness. This lengthwise cupping of the leaf is made possible due to a specialized joint on the leaf’s petiole (seen at the base of the leaf) called the pulvinus. The pulvinus allows this movement in the leaf and also makes for easy identification of this family. If ever you had to choose but one plant amongst all of the other plants on the planet to co-exist with or you ever found yourself in a dire survival situation, which plant would you choose; which plant would you seek out? 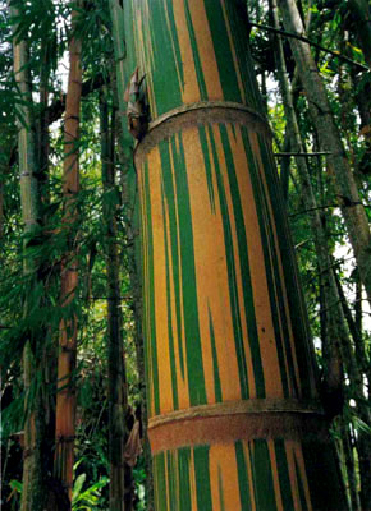 (Hint – it is a tropical plant, that can grow up to 100 ft. in height, produces a nut and is the paradigm of the tropics and tropical beauty). Well, if you chose the Coconut Palm, Cocos nucifera, then you chose wisely and your chances of survival would be high. In Malaysia it is called “the tree of a thousand uses” and in the Phillipines “the tree of life” – and these titles are highly warranted. Over numerous decades and generations, the world renowned song “Imagine” by John Lennon has touched the hearts of billions of people and made us all contemplate, at some time, living in a world united in peace – a oneness. His lyrics have inspired us to imagine a world without a heaven, a world without countries, a world without religion, without possessions, a world without a need for greed or hunger. These were, and still remain, very thought provoking and profound words to encourage world peace. But, sadly enough, here in the year 2011, these things are still so hard to imagine. Wars continue to rage around the world as does greed and hunger. John Lennon wrote these lyrics in the 1970’s – the era of the peace movement that was born due to the Vietnam War. If there were ever a world-wide popularity contest of families in the plant world, without a doubt, the Araceae family and its members would win – hands down. This family’s realm of existence extends from the most frigid of northern climates to the sweltering tropical rainforest of the southern hemisphere. Its fame is not due to characteristics such as possessing exquisitely-beautiful or scented flowers (as the orchid), or deliciously- sweet fruit (as the mango), or intricate and outrageously- colorful foliage (as the croton). The truth is that this family’s expansive recognition is mainly due to the fact that it can tolerate low-light conditions, adapt to low-humidity environments, scoff at neglect and travel well. And, yes, their handsomely-bold and striking foliage has also greatly helped. This renowned family of plants includes an astonishing 108 genera and nearly 3,700 species. With the assistance of man, its celebrity members have traversed the globe from their native tropical habitats into shopping malls, offices, hotel lobbies and homes of every climate imaginable. A tree is not just a tree, a flower is not just a flower and a fruit is just not a fruit. 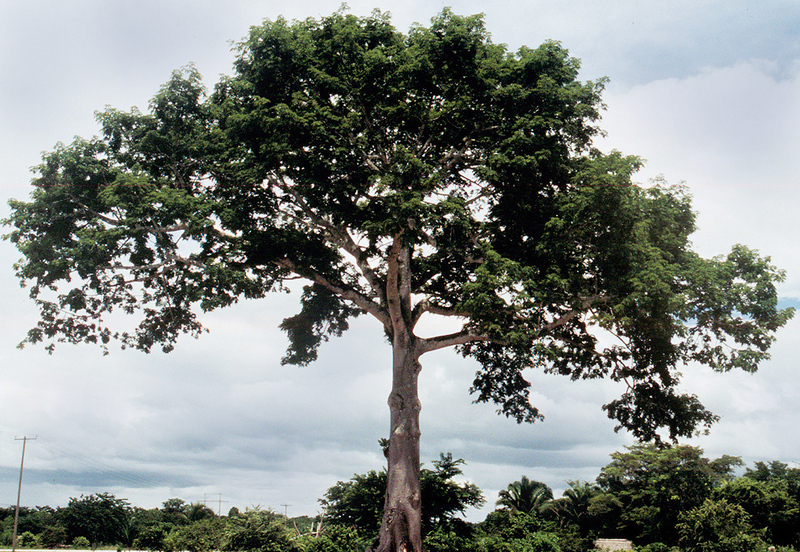 To describe a plant by saying that it is a “tropical tree with green leaves and yellow flowers” is similar to describing a person by saying “it is a Latino man with black hair and dark skin”. This oversimplification of descriptions leaves one scratching one’s head in wonder and as clueless as ever. Plants, as humans, are not all created equal. They are characterized and classified in an assortment of ways to distinguish them, or their groupings or types, and to help in their identification. Having an identity is as important in the plant world as it is in the human world, although, plants, unlike humans, can be preserved for future usage and benefit – an even greater reason for correct identification. The delectable, juicy and unsurpassed sweetness of the Mango fruit is enjoyed by more people on a world-wide scale that any other fruit. Mango is considered the “King of Fruits”. They are associated with fortune, abundance and fertility and are represented in religious themes of South Asia’s Hindu, Buddhist, Muslim and Christian communities. It is said that the forbidden fruit or “apple” in the biblical story of the Garden of Eden was that of the Mango. Fossil records dating back 25 to 30 million years have revealed the Mango’s center of origin as northeast India, Myanmar/Burma and Bangladesh and their cultivation dates back more than 6,000 years. February and March are not exactly my favorite times of the year here in Costa Rica. Yes, these are our peak months for tourism but, as a plant person, my thinking leans more towards garden activity. It is a time when we are not suppose to be planting, but I say, if there is a reliable water source and reliable labor available… then let the planting proceed. This summer began with milder than usual temps and continued, cooling showers in December and on into January, but who knows what February and March will bring. With these conditions, it is has been especially difficult to halt the planting. Summer in the tropics does have its advantages and “silver lining” in the plant world and one of those is that this is the time of the year when the flowering trees – do their thing. With the onset of higher /dryer weather, many tree species will shed their leaves and begin their reproductive cycle of flowering and seed production. It is almost a dormant state for many plants, where little vegetative growth is occurring compared to the rainy/”green” season. Ginger. The word, in and of itself, has an essence of beauty and intrigue. It can stir your senses with images of the exotic, or bring feelings of delight to one’s lips by its soft pronunciation of syllables or to ones taste buds by its savory, tangy flavor. 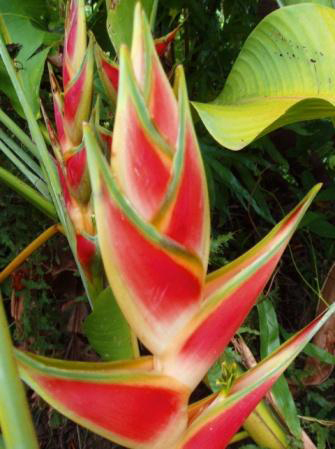 But, here in the tropics, Ginger brings pleasure to the eyes as well. It is the name commonly bestowed upon hundreds of plants that belong to the family Zingiberaceae, which include approximately 52 genera and 1,300 species. Zingiber officinale is the culinary and medicinal ginger whose aromatic, rhizomatous root is world renown. It has been in cultivation in India and China for millennia, and therefore its exact origins are unclear. Unlike many of its Zingiberaceae relatives, its claim to fame is its swollen, antler-looking roots, and not a colorful, showy flower or handsome foliage.